Thread: My castle needs help! Looks fine to me! I'd put an embellishment on the top of the L turret...maybe use a pigma pen to put on a flag? Life may not be the party we planned for,but while we are here we should dance! I think the little girl that gets that block in a quilt will be thrilled. She won't know that the turrets are not all supposed to be different. I think it has great visual interest and you color choices are perfect for a "princess" quilt. I LOVE it!!! Looks AMAZING!!! I think it's perfect, as is,. Not much is ever the same. It has visual appeal. I love it. Looks good to me. Fabrics are perfect, definitely looks like a castle. ​It looks great to me! Embroider a little flag pole on the one turret and add a little appliqué triangle flag with her initial embroidered on it. OP here....thanks for the sweet comments! I thought you would all tell me to tear it apart and start over! . Embroidered flagpole with her initials is perfect! Originally, I was going to do several of these blocks with sashing-scrappy in pinks and purples cuz she is a purple-lover. Better ideas for a layout? Want to keep size down to a lap quilt size....will 9 patches look too busy? You could do different types of flags/embellishments on the different blocks, so each block is unique. Better ideas for a layout? Want to keep size down to a lap quilt size....will 9 patches look too busy? Do you mean 9-patch as an alternating block? I would find that distracting. I would find a fun print that goes with the concept of a castle (princess, dragons, trees, butterflies.....) and cut a piece for each alternate block. OR I would do an hourglass block between. Carolyn, cute ideas! Thank you! I agree, Mad, the alternating 9 patches would look busy. There are some cute princess fabric prints....hopefully I can find one with purples...and the hour glass blocks is a great idea as well. 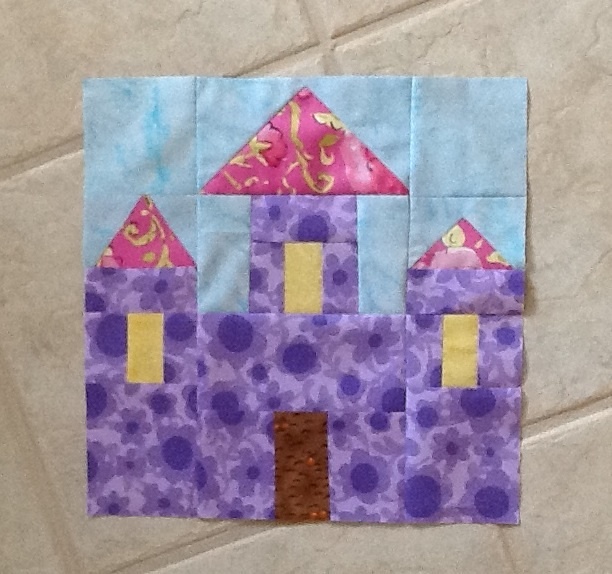 This quilt is for my 3yr old grand daughter-totally into princesses....hope to have this done for Christmas. I love it and the colors are awesome. I think it makes a quilt unique when it has the special touch of the quilter. I'm looking forward to seeing your post of the quilt after you have it finished. A castle has lots of different height turrets. I think this looks very nice. I think it looks fine. Now move onto the next one. Don't stress out on this. It looks great to me too. Colors are perfect. I'm impressed that you drafted it yourself. Nice work. I like this block, the colors, the castle. The turrets don't have to be the same size. Keep going. It's okay to have it not perfectly symmetrical. It actually adds charm to the castle! Maybe one turret is for Rapunzel and the other is for a lookout? I really like the colors you used. Maybe you could have horses or trees or mountains between the castles? So there might be only five castles alternating with 'scenery'? Fairy godmother? Jewel chest? Tiaras and scepters? I don't think you want them to be the same.....looks like you intended it that way! I think it is perfect just as it is! This is going to be an adorable quilt for a precious three year old. Love what you did: pattern and fabrics are perfect. Looks great just as it is. Very cute. I like this the way it is. Not everything on a building is the same. You made this unique and if it fits in your quilt then leave it. Another idea for alternate blocks; shields made from complimentary fabrics. I believe UFOs are like scraps, ferns and dust bunnies. Once you get two, they send spores out into the air and more just happen anywhere the spores meet.